This southern recipe makes a great side dish for chicken, fish, and seafood or a yummy dessert served over vanilla ice cream! Heat clean grill to 400 degrees (medium heat). Moisten grill with butter, olive oil or cooking spray. Cut, split in half, and remove pit using metal spoon. 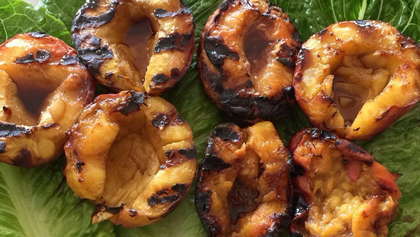 Turn peaches and brush with marinade. Close lid and grill 3 more minutes. Transfer peaches to a serving plate. Brush or drizzle remaining marinade over peaches. Makes a great side dish for chicken, fish, and seafood or a yummy dessert served over vanilla ice cream.